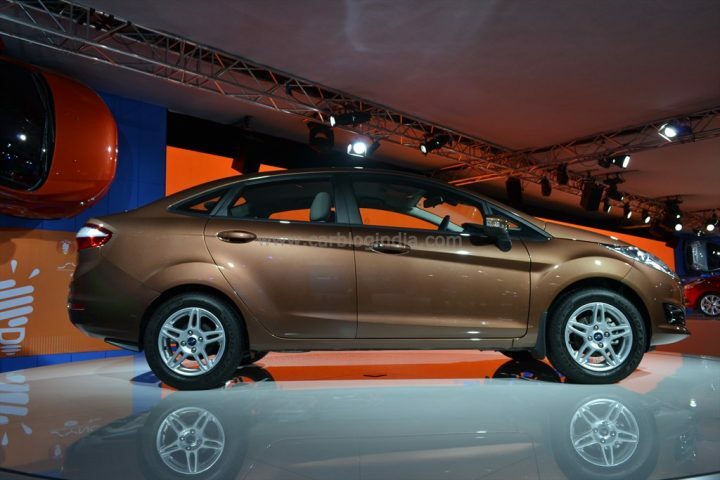 Ford India has finally brought the global new model Ford Fiesta to India at the Auto Expo 2014. In this article we share with you all the details you need to know about the 2014 Ford Fiesta new model for India which will hit the showrooms by mid of 2014. The upcoming Ford Fiesta may only be offered with the diesel engine, Ford seems to have taken this decision to keep their losses to the minimum. They might re-introduce the petrol engine once they see some demand for it. The diesel engine will be carried over from the earlier model of the Fiesta, which means it will be a 1.5-litre mill producing 90 BHP / 204 Nm mated to a 5-speed manual transmission. New information suggests that the Fiesta will be offered only in three trim levels – Ambiente, Trend and Titanium. This has been done to keep the car competitively priced. Ford will be cautious with the new Fiesta, it had a very bad outing when it was launched in 2011 even though it was a good car. Let’s wait and watch as to how the car will be priced this time around. Ford has started promoting the 2014 Ford Fiesta on its website and it’s social media pages, indicating that the company is getting ready to launch the car in India very soon. The car was showcased at the 2014 Indian Auto Expo (report below) and is basically a facelift with minimal, if not zero mechanical changes. The biggest change will be to the exterior design, added features like SYNC with AppLink multimedia system, a Start/Stop system, Automatic wipers and headlights, more storage solutions etc. The Fiesta is expected to be powered by the same 1.5-litre petrol and diesel motors on offer on the current model. 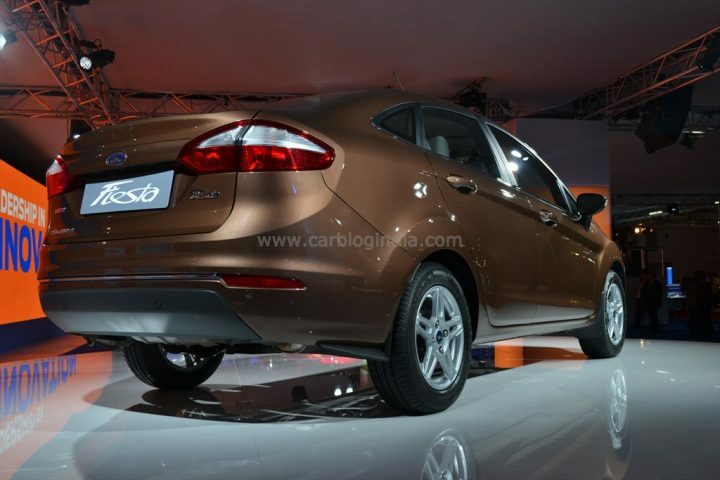 We hope Ford India adds the brilliant 1.0-litre EcoBoost engine to the lineup too. It will be interesting to see how Ford handles the sales of the Fiesta, it has received much flak from customers who have had to wait a long time to get their units of the Ford EcoSport. We hope Ford sets things straight before they launch the car in India. It is one of the best driving cars out there with unique features, the lack of rear seating space and the high price tag has stopped it from becoming a big hit and we hope that the new car is marketed better. What do you think? Let us know in the comments section below. The new Fiesta gets new design compared to the previous model and looks more bolt and stylish with a larger grille, new sculpted design at front, new fog lamps, new alloy wheels. In profile, it looks similar to the previous model, but front and rear get new treatment making it look more attractive than the previous model. The wheel arches are more pronounced, the body lines are more visible and are noticeable, the Kinetic design language is clearly visible on grille, sleek headlamps, tail-lamps etc. The boot space is fairly large and can fit at least 3 large bags. The interiors are very similar to what we see on the previous model and the EcoSport. The same dual tone black silver touches are used with new fiesta too. Additionally it gets some new features like App Link technology from Ford-Microsoft Sync system which allows voice command access to apps on the smartphones which are paired with the car. The detailed specifications have not been revealed by Ford at this stage, it will be revealed closer to the price announcement of the car which is expected to happen around mid of 2014. We expect that Ford may not make any major changes to the engine and transmission system other than minor improvements in performance and fuel economy of the car. The drive train also is expected to remain the same. The previous model of Fiesta comes with a 1.5 Litre petrol Ti-VCT and a 1.5 Litre Diesel DuraTorq engine. The petrol engine produces around 104 BHP of peak power while the diesel produces about 90 BHP and both of them are mated with a 5-speed manual transmission. The petrol model also comes with a 6 speed dual clutch automatic transmission which we have tested earlier and found it to be really peppy and high on performance as well as fuel economy. Some of the weak points of the old model, which includes not-so-spacious rear seats seems to have been addressed here with new improved interior packaging. We will be able to share more details when we drive this car, which should happen soon. Do keep an eye on out test drive reviews section to check out the same. The 2014 Ford Fiesta new model prices have not been revealed for India, but going by the pulse of the market, we believe that it will be prices in close competition of new Honda City and Verna sedan as its direct competition for new Fiesta; which means that we can see a pricing starting around Rs. 7.5 lakhs for base petrol going up to Rs. 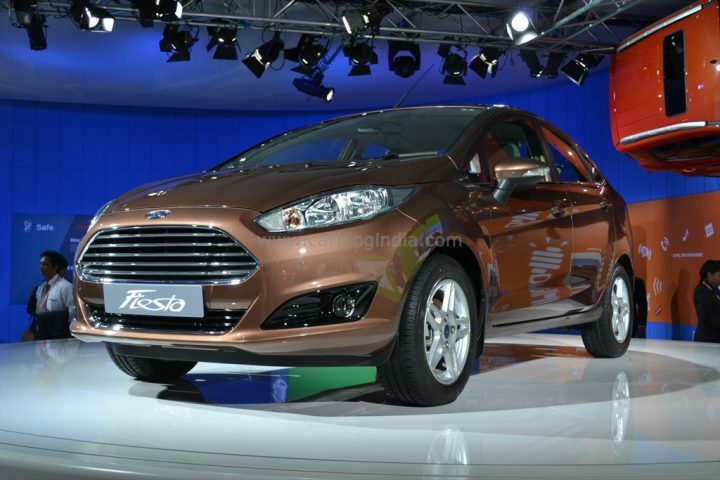 11 Lakhs for top end diesel Titanium variant of the Ford Fiesta.